Most Germans will fondly remember the Schultüte, a cone shaped cornucopia filled with sweets, treats and toys given to them when they entered elementary school. Einschulung, the first day of school, is considered a rite of passage for a child, the start of one’s academic life, and it’s celebrated by the presentation of gifts, the snapping of photos, and then the exploration of what the school cone holds. The history of the Schultüte dates back to the year 1810 in the Germanic regions of Saxonia and Thuringia. Here, wealthy and privately-schooled children received large cone-shaped bags filled with sweets and toys to celebrate their first day of school. It wasn’t until much later that lower class children were given public schooling. Then, the practice became mainstream and has since grown into a time-honored back-to-school routine. However, in 1910 this handcrafted tradition was compromised. Carl August Nestler from Wiesa in Saxony began to mass-produce the token bags. Today Schultüten are mostly produced by machine, and more than 700,000 of them are sold every year in Germany. These days the Schultüte is given to students of all ages by family, friends or partners as encouragement for the long academic road ahead. In Germany, you can find Schultüten available at most school and office supply stores in July and August. 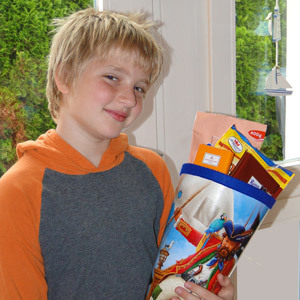 You can purchase an authentic German Schultüte in North America as well, but if you want to be creative, why not make one on your own, and fill it with just the sweets, treats and school supplies you know your little one will most enjoy. Some fun things to include in the cone: pencils, crayons, erasers, watches, yo-yos, hair ties, gum and stuffed toys. Then, as in the German tradition, fill the cone to the top with some authentic German treats. It’s a sweet tradition that North American students are sure to appreciate! See Back to School with Lots of Energy. See our online store for these and other goodies! To all new students in the United States and Canada, we wish you ‘viel Glück und Erfolg‘ (much luck and success) in the year ahead!